The system is easier to demonstrate than it is to explain. To see how elegantly simple and effective this system is, just text the word “Demo” to 1234~231~9555. You will receive a one time text message back with a link to click. Click on that link, and then click “Allow” to see the Push Notification Customer Messaging System in action. You will next receive a message on your phone that will go to a sample coupon page, and the entire process shows you what we can implement for your business. For the low investment of $47.00 / per month (for up to 2,000 customers), we will provide you the code to use on your own website or we can even build you a new website, optimized for SEO and include your own Push Notification Customer Messaging built right in (just ask for a quote on that). Either way, you can then build your list of customers and entice them with periodic discounts, specials, or just point out certain items on your menu or in your store to bring them into your business. You will have access to your own control panel and your own keyword, such as “Pizza” or “Tacos: or “Suits” to prime the pump using the one time text message. 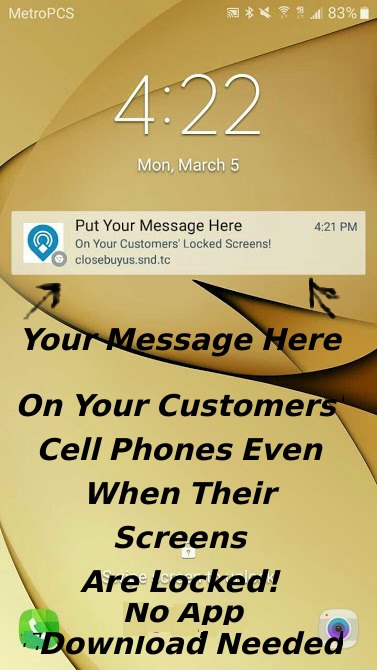 Once they accept push notifications on their phone after texting your keyword, you will have access to the best low cost customer communication system available – Push Notification Customer Messaging! There are no contracts to sign, the billing is $47.00 per month on a month-to-month basis – with no long term obligation or setup fees. However, the system does require setup customized for your business, and a small amount of training for you on the easy to use dashboard. For these reasons, please email sales@cumberlandcomm.com or complete the contact form below to get set up today or if you have any questions at all. Questions? Want To Get Started? Let Us Know!